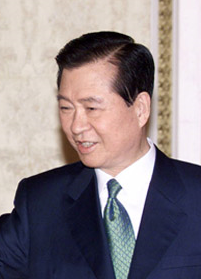 Kim Dae-jung (January 6, 1925-August 18, 2009) was a South Korean president. In 2000, he got the Nobel Peace Prize. He is the first person from Korea to get a Nobel prize. A Roman Catholic since 1957, he has been called the "Nelson Mandela" of Asia  Kim Dae Jung was the President (succeeding Kim Young-sam) from 1998 to 2003. He was born in Haui-do, South Jeolla Province, an island off the South Korean Coast. ↑ Obituary: Kim Dae-jung." BBC News. 18 August 2009. Retrieved 7 November 2009. ↑ "Kim Dae-jung". The Economist. 27 August 2009. This page was last changed on 4 January 2019, at 10:14.